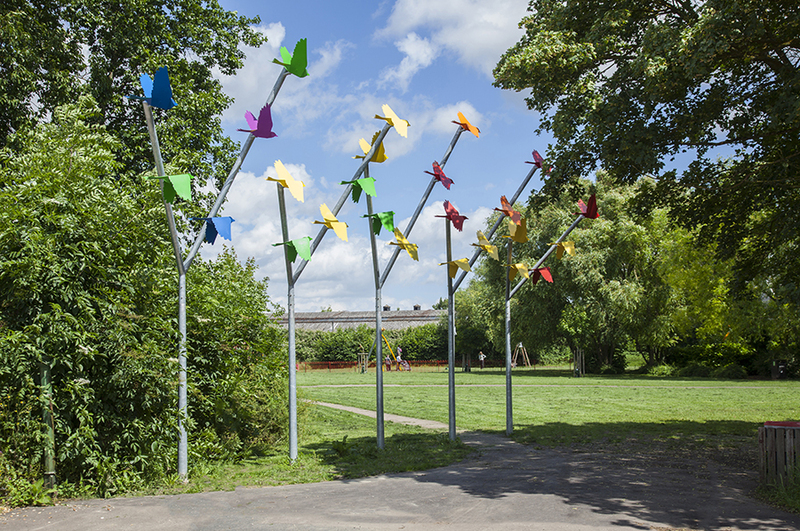 Transforming the largely hidden entrances to Histon Road Recreation Ground in Cambridge, Flocking Birds is a playful take on the brief to create new gateways to the park. 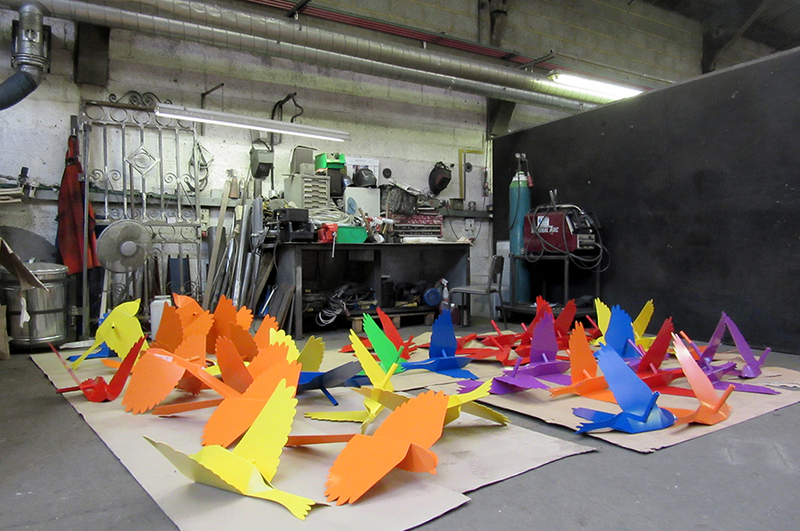 We were drawn to the project by the opportunity to develop a sustained working relationship with young people in the creation of the artwork, exposing them to the whole design process from the initial briefing through to the fabrication and installation. The recreation ground was laid out in the mid 20th century and is an attractive tree lined space, which contains play equipment and is well maintained with areas that are semi natural. The two pedestrian entrances to the recreation ground are via long pathways, which meant that previously the park was not obvious to those new to the area, not inviting the community to venture in and enjoy it. 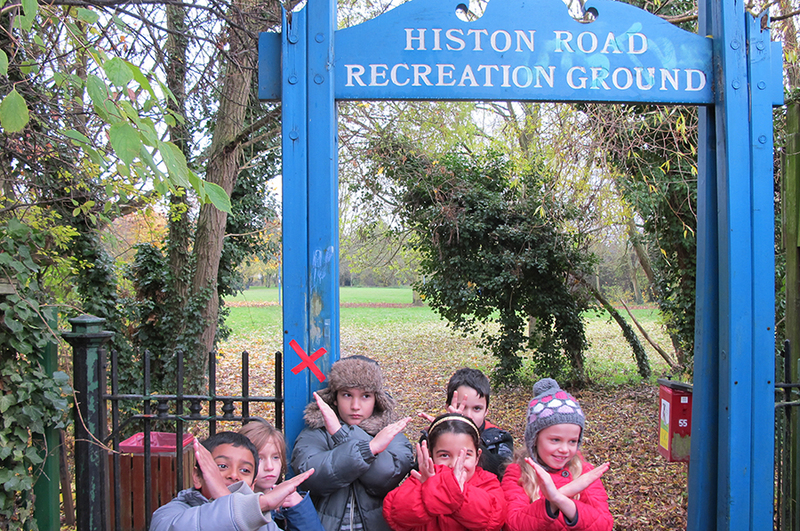 Beginning with a site visit, we worked with three classes of 8-10 year-olds from two local primary schools for the entirety of the project. 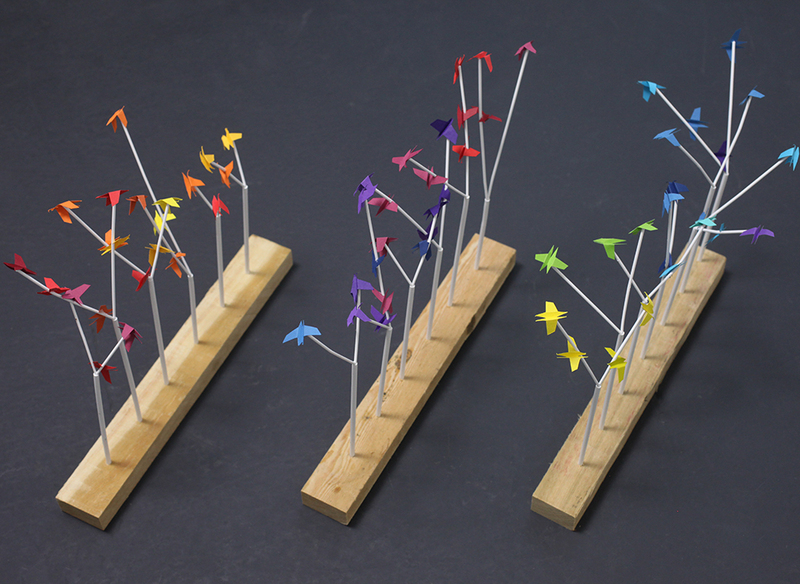 Over ten workshop sessions we treated the pupils effectively as our ‘clients’, taking them on the design process with us. Using a range of techniques we generated a brief with the pupils, teasing out their aspirations for the project based on precedent studies, individual research and historical studies. 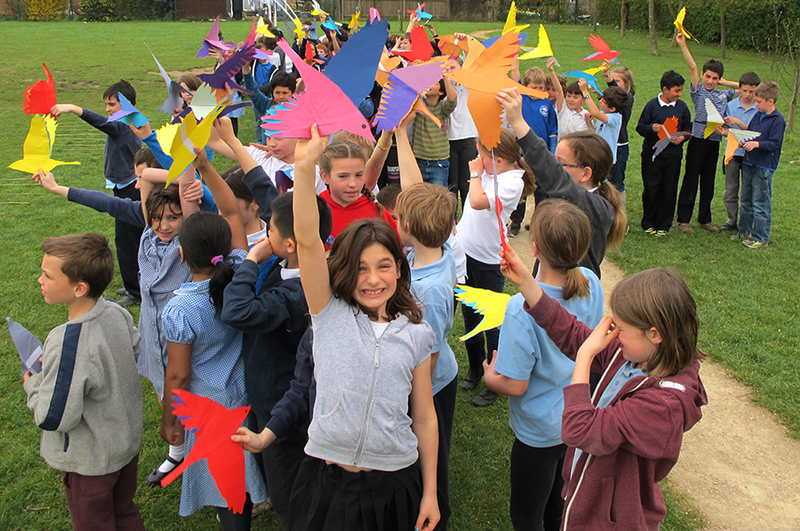 The brief for the project established with the pupils had an emphasis on nature and wildlife. Our response to this was a variety of options that used nature as a starting point for an eye-catching series of markers for the park entrances. 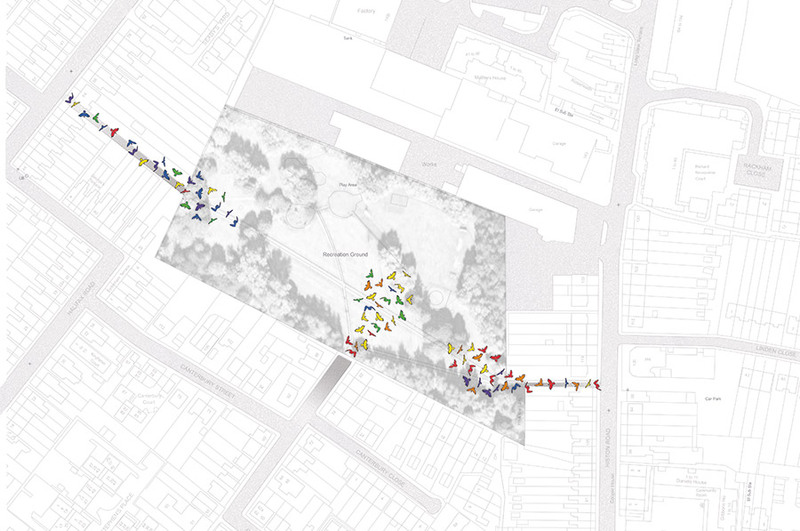 Prior to its use as a recreation ground the site was originally shown on maps as a nursery, perhaps attached to nearby Garden House. 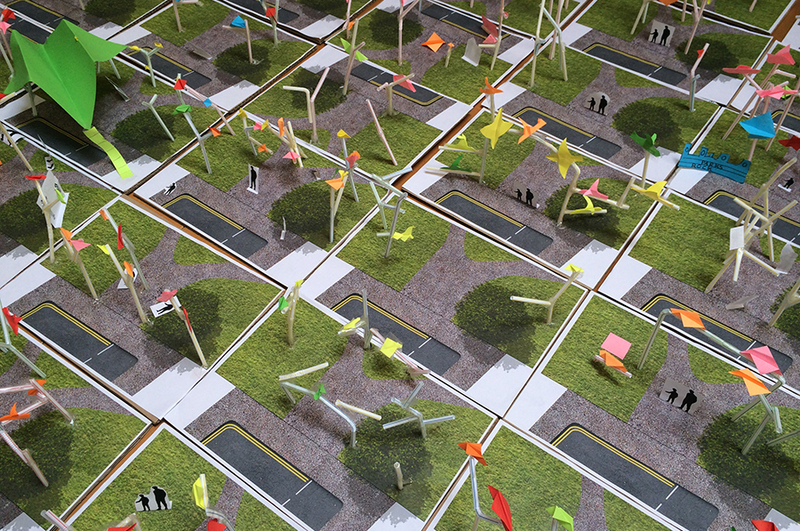 Our proposal sought to evoke the spirit of the tree nursery by conveying the birds that would have once flocked to the site. 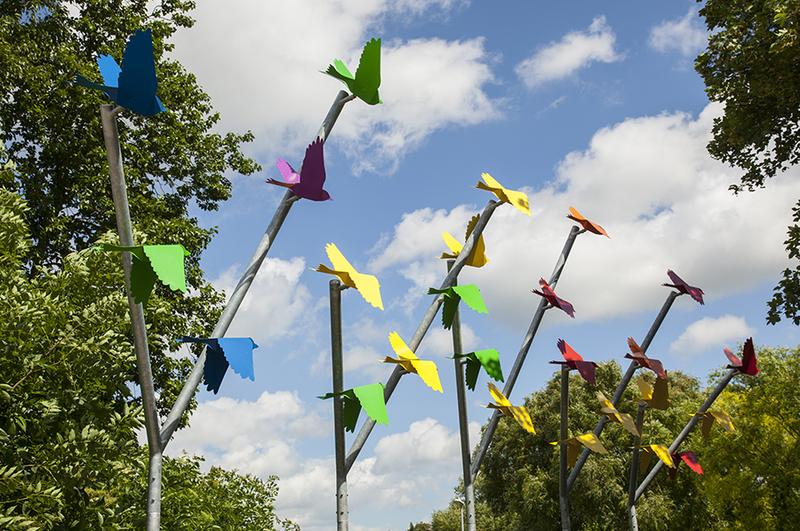 A variety of abstract sculptural birds have been arranged as flocks flying into the recreation ground through the existing entrances. 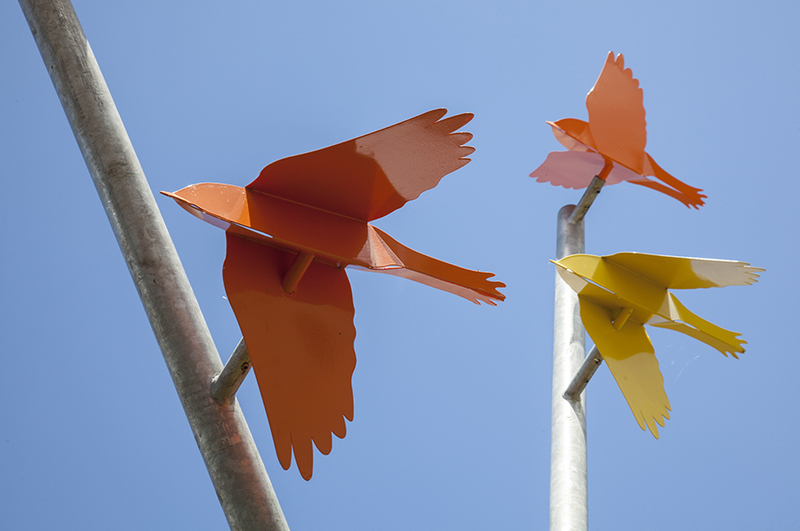 The brightly coloured steel birds are based on species that would once have been spotted in the area but which are now much less prevalent in Cambridge. 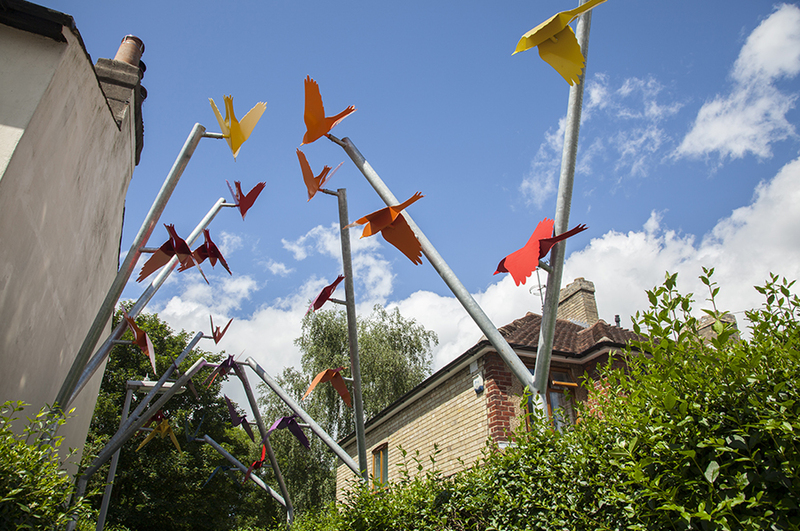 The artwork is composed of a series of folded laser-cut steel birds supported by galvanised steel branches.